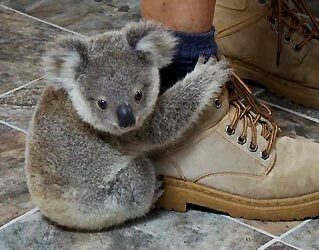 The Koala bear is a native to Australia. It belongs to the family of Phascolarctidae and this means that the wombats are its closest living relatives. Koala bears are usually found in coastal areas of Australia's southern and eastern regions such as South Australia, Victoria, New South Wales and Queensland. Koala bears are mostly found in woodlands and forests and they to inhabit places with cool temperate and tropical climates, especially if it's close to a nearby creek or stream. If you want to keep it protected and/or caged, its best that you plant a tree and then form an enclosure around the tree. Also, make sure that the enclosure has enough sunlight as possible as this will mimic their natural habitat. You can make a small shelter that the Koala bear may use during times of rough weather. If you want the optimum housing for your Koala bear, plant more than one tree. In fact, plant as many trees as possible. Koalas are not very active and they usually sleep for 20 hours a day. However, there are a few ideas you might want to add as a means for your pet Koala's enrichment such as lots of trees to climb and ropes to play with. Koalas are not social animals and most Koala bonding are usually participated only by the mother and her young. Koala bears are herbivores, meaning they only eat plants. A koala bear's favorite food is the eucalyptus leaves. However, they are known to consume other kinds of vegetation, mostly low fiber and high-protein content leaves. A koala bear can consume 400 grams of leaves per day, spread over 4 to 6 feeding sessions. So make sure you have ample leaves and schedule your day for the appropriate feeding times. Most Koala bears do not need to drink water. They get all their fluid needs from the leaves they eat. However, this largely depends on your Koala. If your Koala bear is larger than the average size for its age, then he or she may need additional source of water. Just make sure that you keep the water clean and change it regularly, otherwise it may be a cause of health problems. Koala bears are not very active when it comes to breeding. In fact, they only breed from the month of December to March. A Koala bear is ready to breed around 2 to 3 years of age. Breeding koalas need to be well fed as they have a tendency to avoid mating if they do not have the energy to spare. Once the female is pregnant, you can expect a baby Koala bear after 35 days later. 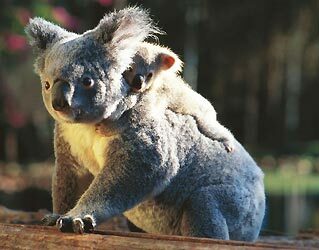 Koalas are marsupials, which mean they have a pouch in their abdomen to carry their young. Koalas tend to move slowly to conserve energy. Koalas are tree-dwelling creatures and they spend most of their lives in the treetops. Koalas have unique characteristics, such as fluffy ears, spoon shaped nose and tailless body, that makes it distinguishable by anyone at first sight. One distinguishable characteristic of Koala bear is their fur. It's thick and woolly. The fur protects the Koala from extreme high and low temperatures. Also, the fur acts like a raincoat. The color of the coat may be light gray to dark brown, and the color largely depends on where your Koala is originally from. Koalas from the southern part of Australia have thicker and darker fur compared to the north.